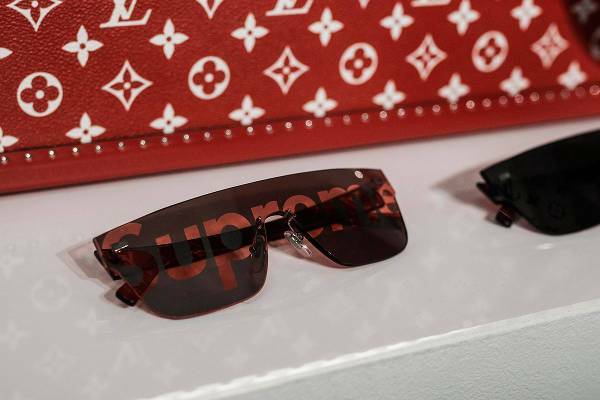 Themed collaborations in the high-end fashion houses are nothing new, but the famous luxury house, Louis Vuitton’s collaboration with Supreme has definitely garnered some hype in the audience. The French fashion house revealed the co-branded designs at the men’s fall 2017 runway show in Paris. You would agree to the fact that today you can certainly not talk about New York’s men’s wear without mentioning Supreme. 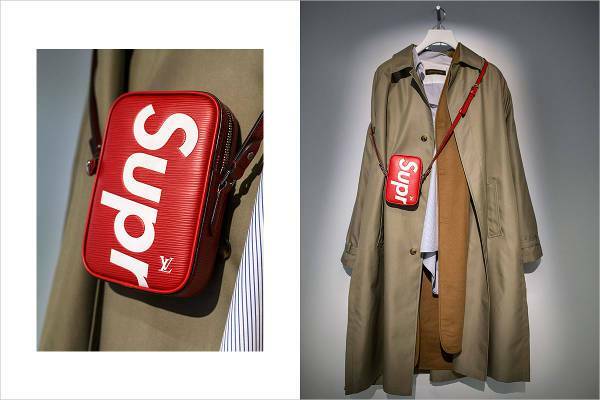 According to Kim Jones, Vuitton’s men’s artistic director, the collaboration holds a strong value as he had always been connected to the brand since his college days, making the unification all the more special. The collaboration features a range of items starting right from New York–inspired bags, jackets, wallets, belts, sneakers, baseball caps, to bandanas, accessories and more. All the pieces carry the logos of both the brands. 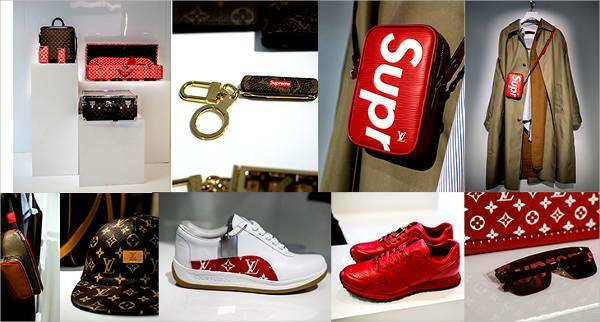 Supreme’s graphic when paired with Louis Vuitton classic logo results in a classy and phenomenal result. The pop art feeling works together perfectly in delivering a lively and sturdy collection. 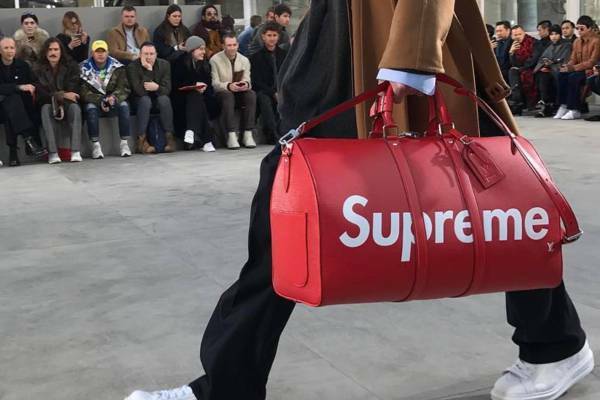 The red leather duffel bags are expected to be priced between €1500-3000 and over the shoulder style fanny packs, priced in a similar range, are going to carry the Supreme graphic. With a total of 6 styles of bags in the collection, you are certain to find one to suit your preference and style. The bags will be fashioned out of three different material including Epi leather, black Epi leather, and a camouflage fabric. Just like the bags, the scarves and bandanas also use the brand’s logo. 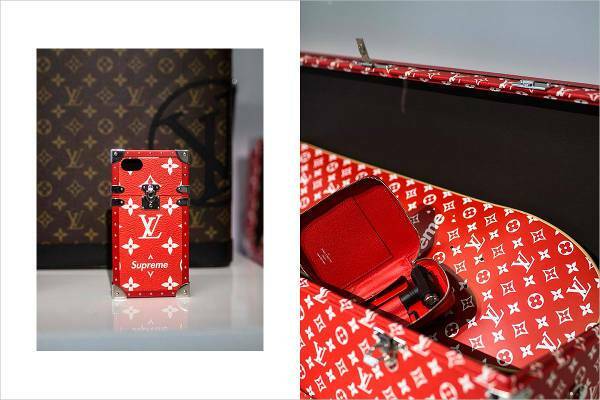 One of the added delights of the collaboration is the LV x Supreme wallets and iPhone cases, something worthy to spend on this season. 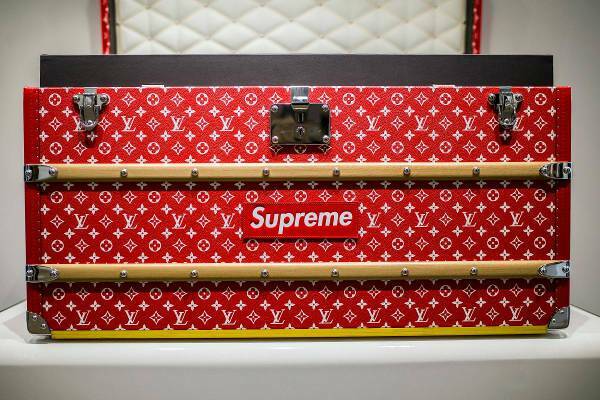 Coming to one of the most talked about pieces, the Louis Vuitton x Supreme steamer trunks and customized skateboards are not yet ready for retail, as per the information from the brand. The collection is expected to be available in the Vuitton stores from July. The collaboration is nothing like Supreme’s prior collaboration as it will be ‘NOT’ be available at the brand’s brick-and-mortar stores or online. 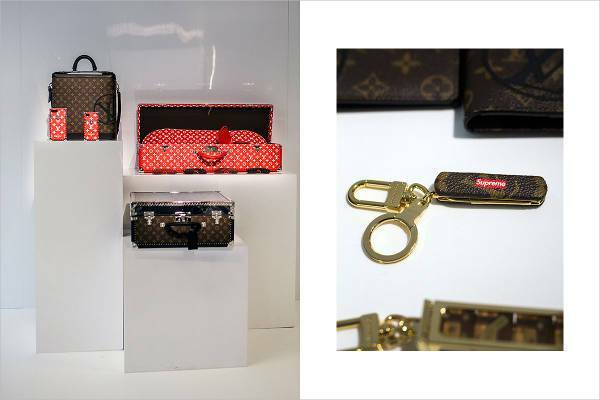 The limited collection will be exclusively sold through Louis Vuitton stores and some other temporary locations, which are common to both the brands. 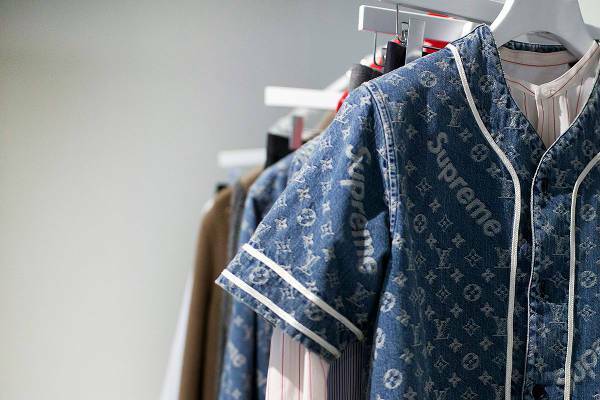 Just like the luxury brand’s previous collaborations, the current collab with Supreme is also going to be closely monitored, giving the fashion house an upper hand to control all the variables and also benefit largely from the partnership.